Last week, a friend told me that St. Valentine’s day is only for women, that it’s all about men spoiling their S.O. with chocolates, roses, and romantic candle-lit dinners. And we’ve all heard someone say that Valentine’s is purely a consumer holiday, something that was created solely to drive sales of cards, chocolates, and fuzzy teddy bears with velvet hearts sewn onto them, who sing barely audible love songs when you squeeze their paw. 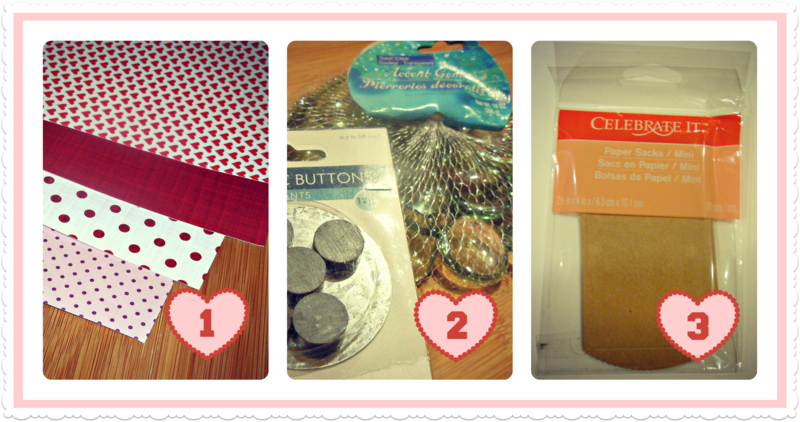 Whatever your views of Valentine’s are, there’s no denying that the holiday is a prime opportunity for crafting. 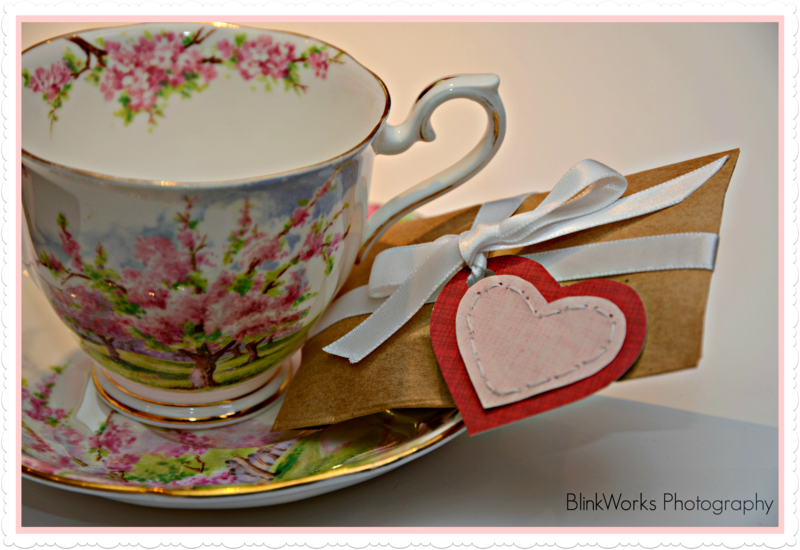 There are lots of cute ideas out there for Valentine’s crafts (try looking up heart garlands or Valentine’s cards) and of course, heart-shaped cookie, cake and candy recipes are everywhere on Pinterest. Do you remember how in elementary school, on Valentine’s Day you always had to bring enough Valentine’s cards to give out to everyone in the class? Which meant you even had to give that bully who kept pulling your pigtails a “I like you berry much” strawberry-shaped Valentine’s card, even if you didn’t like him “berry much”. While I think that having to give out a card to everyone you know is a bit extreme, I like the idea of giving out little Valentine’s gifts to your friends. 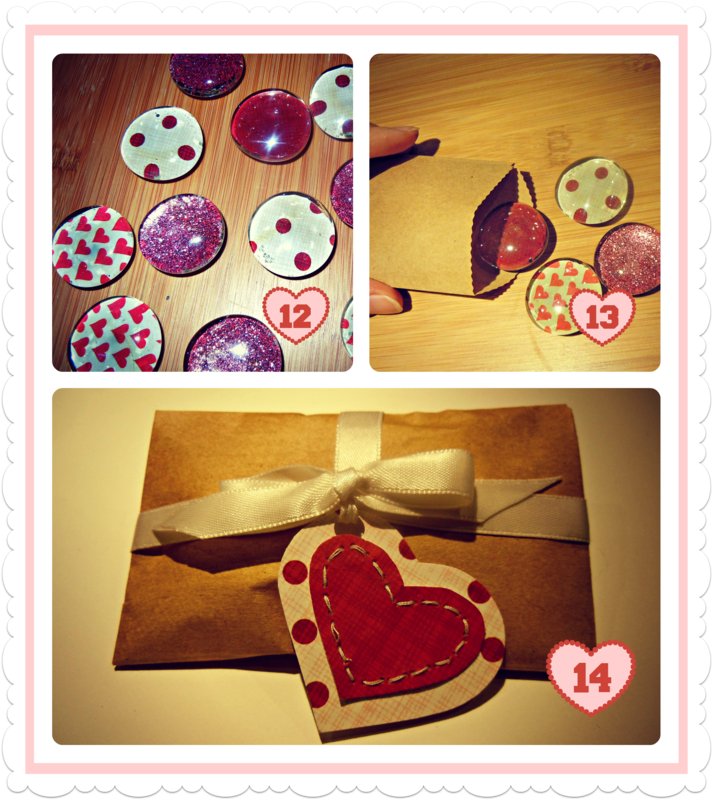 So, this year, I tried to think of what crafty gift I could give out as “Valentines” to friends and family, and came up with these Valentine’s gift pockets, cute little Valentine “special-delivery” packages filled with custom-made glass magnets. Glass vase gem magnets have been widely done on craft blogs (here’s a really great tutorial by Not Martha here), but I thought I would give my own take on how to make them as part of a gift-pocket party favour, where the focus is more on the design of the packaging and magnets together. Depending on the designs on the paper you use for the magnets and packages, these little gift-pockets could be used for many different occasions: wedding or baby showers, birthday party favours, etc. 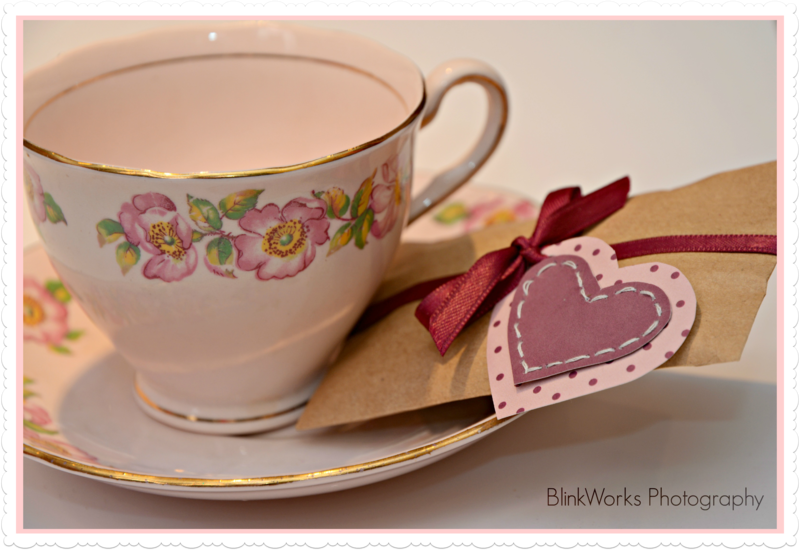 *Note: I’m excited to announce a family collaboration with my mother, Mikki, of BlinkWorks Photography! Mikki’s gorgeous photography will be often gracing Urbanista At Home’s posts in the future, displaying different projects and tutorials. While most of the photos in this post are my own dodgy photography, a number of the photos in this post are by her: look for the BlinkWorks Photography watermark in the bottom of the photos in this post to see which are hers! 1) Pick out some Valentine’s themed/coloured scrapbooking paper with patterns that are visible through the glass vase gems (ie. small enough hearts, dark enough designs). Also, for the paper heart “pendant” for the front of the gift-pocket, pick out two coordinating colours/designs for the front and back pieces of the pendant. 2) At the dollar store, pick up some small magnet buttons (often sold in packs of 12 or 14) and a pack of clear glass vase gems. You can get these in small (3/4″) or large (1 1/3″) versions, and they look like marbles that someone melted and squished. 3) For the actual “pockets” for the gift-pockets, buy some smallish envelopes (in natural or white) that would fit 3 or 4 glass magnets. At Michael’s Craft Store, I found packages of “Celebrate It” brand mini sacks, which were the perfect size for a few magnets. 4) Trace around each glass gem on a variety of the paper you have picked out. I’m going to suggest tracing each gem individually (because each one has a slightly different shape) but in all truthfulness, for easiness and efficiency, you can probably just use one gem and trace and cut out a bunch of circles at once. 5) For a variety of magnet designs, cut out circles in a number of different patterns/colours that go well together. 6) Squeeze a dab of craft glue onto the flat side of the glass gem and place a paper circle over it, with the patterned side glued to the glass. Press the paper to the glass gem tightly to minimize bubbles. Turn the glass gem upside down and glue a magnet button on top of the paper. Repeat with the rest of the glass gems and leave them to dry overnight (or for the amount of time specified on the craft glue bottle). 7) Draw and cut out a smallish (1.5″ across) heart out of scrapbooking paper to make the “front” of the paper heart pendant. 8) Draw and cut out a slightly larger heart (2″ across) out of a coordinating scrapbooking paper to make the “back” of the paper heart pendant. 9) Using thread and a needle, sew a row of stitches about half a centimetre in from the edge of the smaller heart, as in picture 9 above. 10) With a hole punch, create a small hole in the upper left-hand corner of the larger heart, close to the cut edge. 11) Glue or adhere (with double-sided tape) the small heart to the centre of the larger heart. If you want, write a message on the back of the large heart. Be Mine, Valentine! 12) By now your magnets should be done! Turn them over and wipe off any glue spots or streaks that may have gotten on the front of the glass gems, and they’re ready for packing! 13) Create “sets” of magnets by choosing groups of 3 or 4 magnets that go well together. Put each set into a mini envelope/sack and close the envelope with glue, tape or the adhesive provided. 14) Using ribbon that coordinates well with the paper heart pendant, thread the heart pendant through the hole you punched earlier, and tie a bow on the top of the envelope, “package” style. 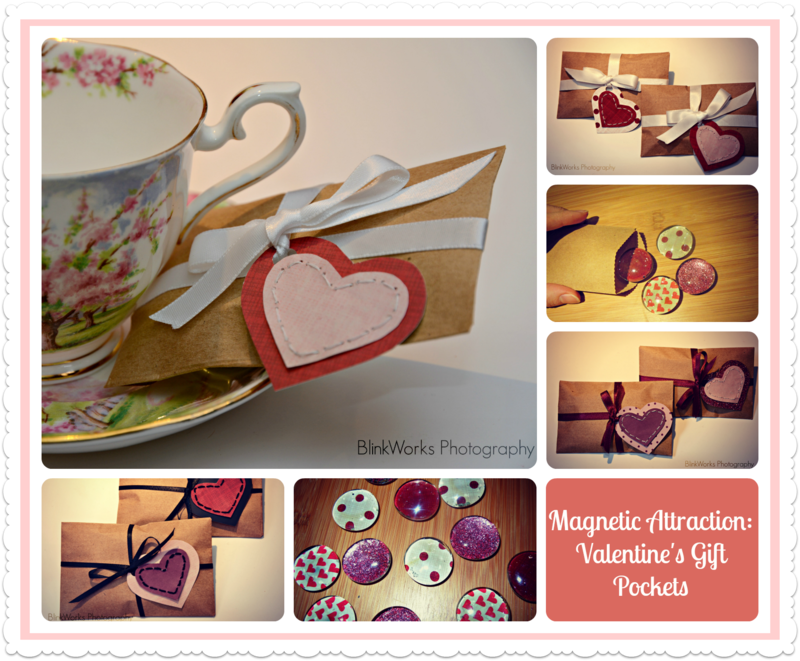 And you’ve now made a Valentine’s gift-pocket, ready to gift to your nearest and dearest! Make as many or as few of these as you want to; the most fun part is creating different paper/pattern/colour combinations for the heart pendant and ribbons. I’d love to see or hear about any colour combos you come up with – feel free to hit up that comment section and leave some feedback! Previous Post Feel Like Being Social? Urbanista At Home is now on Twitter and Instagram! Next Post Guest Blogger Marina: Who says bouquets only have to consist of flowers? A DIY Personalized Bouquet in 4 Easy Steps!